Our Story | Scranton Running Co. The Scranton Running Company was founded in 2010. Serving the needs of Northeastern Pennsylvania’s runners, walkers and fitness enthusiasts, we envision a thriving running and walking community in the area, and will tirelessly promote the benefits of an active lifestyle to all ages. Our expert staff is knowledgeable in shoe fitting and gait analysis with a focus on injury prevention. Come visit with us and share your stories. We’ll get you laced up properly and hitting the roads in no time at all! Born and raised in Scranton, PA, Matt earned his footwear fitting stripes in the City of Brotherly Love: Philadelphia, PA. There he was a Manager at Philadelphia Runner, a specialty running store in the University City section of Philadelphia. 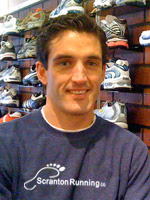 Matt joined the Philly Runner team in 2004 and oversaw all aspects of the store’s operations. His product knowledge and ability to outfit a customer in the appropriate running or walking shoe is unsurpassed. 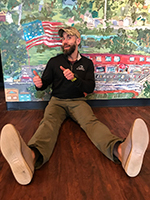 When not at the Scranton Running Company, Matt can be found running the streets and trails of Scranton, starting and ending in his favorite place in the world: Minooka, PA. While at Scranton High School, Matt set the school record in the 3200 meters (it still stands) and earned three-time All-State honors. At St. Joseph’s University, he won three individual Atlantic 10 Conference championships and was recently inducted into the University’s Track & Field Hall of Fame. Upon graduating, Matt turned his attention to longer distances, winning Scranton’s Steamtown Marathon in 2004, 2006 and 2012. He qualified for the U.S. Olympic Trials in the marathon in 2004 and once again in 2008. He has also represented the United States in the World Mountain Running Championships in 2008, 2009, and 2011. Matt has substantial coaching experience, including mentoring high school runners for the past thirteen years at two separate summer camps. 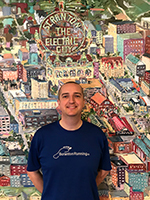 Born and raised in Binghamton, New York, Jason relocated to NEPA after his collegiate years at College Misericordia. While Jason did not compete as a runner in high school or college, he found a passion for running from co-worker and college classmate Justin, who introduced him to long distance running. Since taking up the sport, Jason has run several half-marathons as well as completed the Steamtown Marathon. Jason earned a Bachelor’s degree in Sport Management from Misericordia as well as a Master’s Degree In Sport Management with a concentration in Intercollegiate Athletic Administration from California University of Pennsylvania. He has previously worked as an Assistant Athletic Director at nearby Keystone College. Jason spends a good portion of his time during racing season organizing, managing, and timing local races with our SRC Race Management team. In his spare time, you can find Jason logging some miles up and down the Lackawanna River Heritage Trail. He’s also an avid soccer fan and is known to tune the store TV’s into English Premier League or Major League Soccer games. Born in the wonderful land of NEPA, Joe is an enthusiastic runner willing to take on any challenge. As a student at Sacred Heart High School, he participated in cross country as way to help pass the fall season and stay conditioned for winter sports. After school, Joe enlisted in the U.S. Army, where he served for eight years on the front lines as an Infantry Soldier. Since high school he’s become an avid runner, completing 32 marathons in addition to achieving his longtime goal of running the prestigious Boston Marathon. Joe’s still hungry. however, and if not in the store there is a good chance he’s out there chasing bigger (and longer) goals, or playing with his lovable Labrador Retrievers (Phillie and Rudy). Joe earned a Health and Fitness Associates Degree at Bryan University. He loves talking about the sport and conveying his enthusiasm to every customer who walks through our doors. Joe firmly believes that you can’t enjoy the wonderful world of running with the right shoe leading the way. 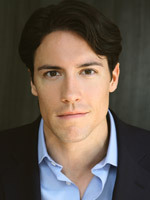 Will was born and raised in Medford, NJ but has since chosen NEPA as his home. He earned a Bachelor’s of Health Science and then both a Master’s and Doctorate in Physical Therapy at the University of Scranton where he also ran cross country, serving as co-captain his junior and senior years. Will is no stranger to gait analysis and shoe fitting having done so at a Fleet Feet in South Jersey during college summers. Now Will is back at it again for the Scranton Running Co.! Feel free to grill him on any of your ailments or request advice on how to become a more efficient runner or walker. When not at the store, you can find Will driving around Lackawanna and Susquehanna Counties, as a therapist for Caregivers America Home Health Services, or spending time with his wonderful wife, Heidi, and son, Liam and daughters Caroline and Rebecca. Born at Travis Air Force Base in California, Justin and family settled in the Hazleton area where he attended Hazleton Area High School. While there he competed in Cross-Country and Track & Field, and found his passion for running. His enthusiasm for the sport continued to grow while attending College Misericordia. At Misericordia he earned degrees in Marketing, Management, Sport Management and a Masters in Organization Management. All the while competing -and eventually coaching- for the Cougars. In Justin’s coaching roles with the team, he helped guide the Harriers to six consecutive PAC XC Championships, and helped write the All-Time Performance lists while competing as a decathlete. Today, Justin is a Level One USATF certified coach, as well as a Jack Daniels Tier 1 certified coach. He enjoys long “runs” on the beach and immersing himself into the Scranton and Wilkes-Barre running scenes in his free time. Justin’s patient, calming and methodical approach to shoe fittings makes him a favorite with customers. Born in Scranton, RJ ‘s introduction to the sport of running was as a member of the Scranton High School cross country and track teams. In the years since he’s maintained a fervent passion for both running and health & wellness, which led him back to college in his 30’s. 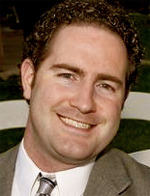 He is a graduate from Marywood University with a degree in Exercise Science and a minor in Coaching. RJ was a three-year captain of the Marywood’s cross country team. He also received the CSAC runner of the year sportsmanship award in 2007 and in 2009. His current coaching role is as Scranton Running Company’s Program Director & Head Coach of our multiple training programs. In 2016 he was nominated and became a finalist for the prestigious Brooks Inspiring Coach of the Year Award, which is a multinational award with over 2,000 coaching nominees. RJ is also a Level 1 USA Track & Field certified coach. 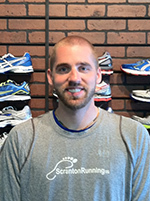 As a valued member of the Scranton Running Company team, RJ will continue to assist all runners and exercise enthusiasts stay injury free as they pursue their goals. With a face like this, Buddy will never be starved for attention. His specialty is in the morale department. And he has two pairs of getaway sticks that any runner would envy. Come visit with him at our location in the Ice Box Sports Complex. We dare you not to smile while doing so.